Top Chef host Padma recommends making your deviled eggs extra fancy this year by using traditional Chinese marbled tea eggs. Hard-boil the eggs in using your usual technique. Steep strong Teatulia® black tea and add star anise and soy sauce to taste. Carefully roll the eggs on the counter, gently cracking them all over, but keeping the shells on. Place the eggs in the tea mixture and refrigerate overnight. 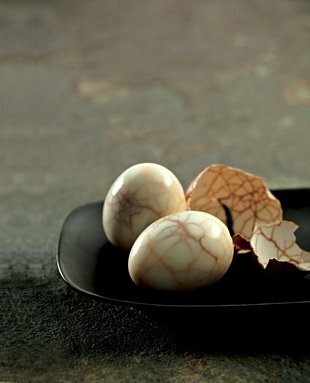 Gently peel the eggs to reveal a spectacular cracked marble appearance. Slice the eggs in half lengthwise and put the yolks in a bowl. Mash them with other ingredients to your liking and refill the halved whites for a more elegant deviled egg.